5th or 15th of the 1st lunar month. 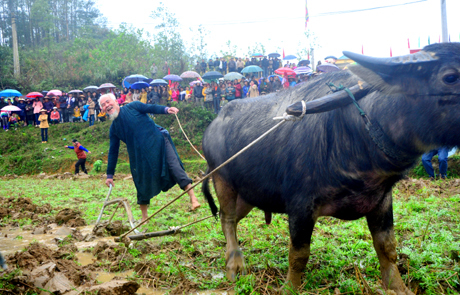 The Long Tong Festival is held in the fields near the village. The centre of the festival is the con tree (cloth-ball tree). There are many merry games such as “nem con” (a game in which boys and girls throw cloth balls), tug-of-wars, playing cockfights by banana flowers, and buffalo fights by aspara-gus. Boys and girls come to the festival to folk dance, sing love songs, and make friends.